Sherrill I knit or crochet in the evenings while I'm watching TV or when I'm the passenger in a car. I find that it nourishes my creativity and actually has me looking forward to my sewing. Crochet is good. Lovely to see you back Sherril. I have been thinking of you from out here in cyberspace over the last few months. 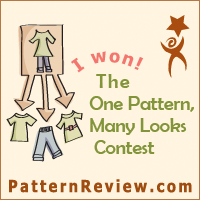 I'm only of the many who use your helpful tips on your blog and on pattern review. I hope you have a lovely holiday and New Year. Good to have you back! Life does have a way of happening, doesn't it? You are my new hero. I have been dieing to learn to crochet and it is one of my goals for the new year. Thanks for the inspiration. Good to hear from you again. :-) Here's hoping 2011 brings blessings to you and yours. Welcome back! I think there are more than a few of us who won't be sorry to see the back end of 2010. I love that top, and your jammies turned out great! It is so lovely to have you posting again. I love crocheting, it's so soothing. Your scarf is beautiful. Glad you're back. Hope you have a Merry Christams and we all have a better New Year. Sherril, I'm glad to see you back and hope you don't stay away long again! Isn't crocheting fun?! I've been picking up my hook a lot more lately so I understand how engrossing this can be! Nice projects! I love a transeasonal pattern like that top--it will look great with long sleeves. hey teach....cool jammies and cool shirt. Love the ease of sewing for you - wish it was the same for me. But enough said on that...love your beginning crochet also. Is there nothing you can't do? Hats off to you my friend. Hey we need to pick a date and get together and sew or just for me to get my machines tweaked by you.